We’re pleased to announce our new Radiohead News Widget for Mac OS X Tiger! For those who enjoy Apple’s Dashboard feature, this widget will make a nice addition to your collection. 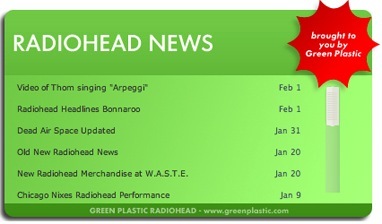 Our widget will grab the latest Radiohead headlines from greenplastic.com automatically! The Radiohead News Widget requires Mac OS X 10.4 and above. To install, you’ll need Stuffit to expand the .sit file. From there, all you’ll need to do is click on the “radiohead news.wdgt” file and it will install to your Widget library.